Flappy Bird creator Dong Nguyen has indicated once again that his record breaking app will be back. 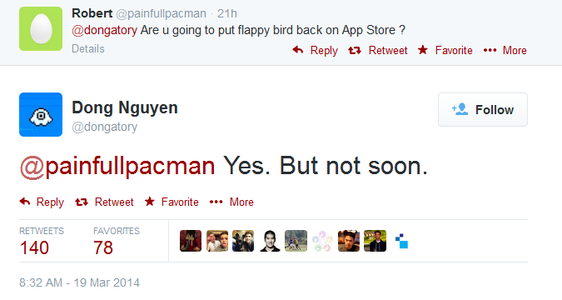 Nguyen said in a tweet that the app is going to return to the app store. Nguyen had previously indicated in an interview that he was ‘considering’ bringing the app back. His tweet confirms that the app will be back for good. Nguyen though has burst our bubble by stating that the app will take some time to be back i.e. the app will not be back immediately. Not only when it does make it back, the app will come with warnings inside, so that people don’t go overboard on it, like they did a little time back. Flappy Bird has been in the news because its simplistic and frustrating gameplay was so addictive that many users broke their smartphone screens playing it. At the time it went down, it was easily raking $50,000 per day in revenue. While Flappy Bird will take its own sweet time to be back, clones of the game are all over the place. But, for the real thing, it seems you will have to wait a little more.